Swarna Sahasra is a Mohiniyattam Dancer with close to 2 decades of experience and exposure. Swarna runs an Indian Classical dance school in Chennai, besides being a freelancer who teaches at three other locations in the city. Here is a candid interview with Swarna Sahasra. When Swarna was 4 years old, her mother who is a dancer too, saw her dance, and was impressed with her moves and facial expressions. Soon, her mother asked Swarna to assist her in the dance classes. Slowly Swarna's interest towards Indian classical dance grew. At the age of 6, she wanted to join Kalakshetra, an arts and cultural academy, but was not eligible to join the dance classes. So they had a test for Swarna and she did pass with ease. Later, she went on to become the youngest diploma holder in dance in Kalakshetra history. She never had a formal Arangetram. At the age of 12, Swarna performed at the Chidambaram temple. Later, she danced alongside 1000 dancers with Dr Padma Subramanian, who was then one of the most respected dancers in the fraternity. She has a huge respect and admiration for Meenakshi Srinivasan, a Bharatnatyam dancer and choreographer, who till today is her favourite but she has not had the opportunity to dance for her. Mohiniyattam or Mohiniattam developed and remain popular in the state of Kerala. Mohiniyattam dance gets its name from the word Mohini – a mythical enchantress avatar of the Hindu God Lord Vishnu, who helps the good prevail over evil by deploying her feminine powers. Mohiniyattam's roots, like all classical Indian dances, are in the Natya Shastra – the ancient Hindu Sanskrit text on performance arts. The repertoire of Mohiniyattam includes music in the Carnatic style, singing and acting a play through the dance, where the recitation may be either by a separate vocalist or the dancer herself. The song is typically in Tamil-Sanskrit hybrid called Manipravala. Compared most other dance forms, Mohiniyattam gives more importance to gestural and facial acting. The Mudras (hand gestures) are almost always same as those employed in Kathakali. The artists try to enact the lyrics almost in its entirety, like in Kathakali, another Indian classical dance that developed and remained popular in Kerala. At the age of 8 or 9, she got introduced to Mohiniyattam at Kalakshetra, and was intrigued by the dance and style. Today, she has established a reputation for sincerity and expertise with her performances around the world. Even after 2000+ performances, she still praises Gopika Varma, her guru for 10 years, for all the guidance. She was always interested in dance & art and Chidambaram Natiyanjali was more important to me than anything else. After successfully graduating high school she continued to dance. At that age, any parent would want their child to study further but her mom was very supportive and allowed Swarna to pursue her dance career though her friends and family were against their decision. During her adolescence, her mother accompanied Swarna to the classes despite her office being far away from home and the dance school. 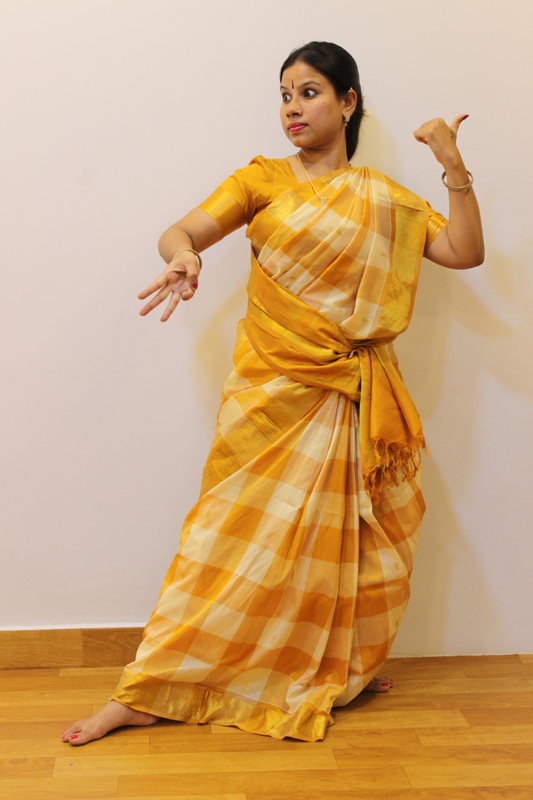 When she was 6 years old, Swarna she started learning Bharatnatyam from Srimathy Vasundra Thomas. Five years later, Mr R Venkatraman (President of India) and C V Chandrasekhar presented me with a diploma degree. Since then, she has danced alongside renowned Bharatnatayam dancers including Srimathi Uma Murali, Madurai Muralidharan, and Shobana. She learnt Carnatic singing in Kalashetra from Charulatha Mani and later from 6 other teachers. It was only after years of learning and researching about dance, she developed the interest for Carnatic singing. Even today, she continues to go for singing classes at least once a week for about 3-4 hours. When she was at High School, one of her family friends saw her live performance, and later insisted Swarna to teach her daughter. Soon, she started teaching full time, and after graduating out of High School, she had 35 students. She even relocated to Singapore for a brief period to teach Bharathnatayam or Mohiniyattam to students. Though she enjoyed teaching abroad, she felt it was better to return to India, start her own dance school, and promote the art in her own country. After 18 months of classes, Swarna's disciple Sandhya Thiagarajanmurthy, a 9th grade student completed her first arangetram on 23 October 2016. The entire arangetram was conceptualised by her. It was titled 'Krishnaarpanam' which focussed on different life stages of Lord Krishna, from being a baby to adolescent to adult stage. In 2016, Swarna inaugurated Sahasra Kalavriksha where qualified teachers teach Carnatic, Indian Instruments & Indian Music. and Yoga is taught by her mother, a therapeutic yoga specialist concentrating in ailments.